Every history of an enterprise such as De Stijl inevitably represents adifferent charting of the terrain, mapping new information or interpretations onto what is already known. But each history is grounded in its own time. There is no 'real' De Stijl which can be uncovered, if only we could go back to the primal (or primary) source. Each account of De Stijl, including this one, produces a new 'De Stijl' which is itself historically located and constructed. The history of De Stijl could arguably be said to reside in the strikingly beautiful objects that the movement produced, including many important paintings, furniture, and other works of art and design that today may befound in the collection of the Stedelijk Museum. These are typically presented to viewers in a manner that allows for direct experience of the formal and material character of each object, thereby suggesting that the museum enables its public to gain unmediated access to an authentic representation of De Stijl embodied in its displays. History appears to bedistilled in these objects, which bear witness to the creativity of the artists who designed and made them in the early twentieth century. At the same time, however, the paintings by Piet Mondrian, furniture by Gerrit Rietveld, and graphic designs by Vilmos Huszár, like the works by other artists affiliated with De Stijl that one sees in the museum, have necessarily been isolated from their original context, removed from the transformative dynamic of historical change in order to be preserved indefinitely in the (more or less) ideal conditions that the museum provides. Yet this process of preservation, which is not only selective but also open to multiple external pressures (from donors or the art market, for example), is inextricably connected to curatorial considerations and scholarly understandings of De Stijl that are far from static. The objects in the museum are thus caught up in a web of competing claims to historical veracity, meant to speak for themselves but always and already part of a constructed narrative, a retrospective history of De Stijl told not so much by the objects as by their interpreters. Moreover, the interpretive narrative of De Stijl has been, from the moment of its initial articulation,partial, contested, and ripe for revision (Fig.1). Not only were the participants in the movement keen to forward their own, often conflicting, interpretations of De Stijl, but art historians and museums also offered alternative perspectives on its historical construction. In fact, the process was not confined to the ivory tower of museum practice or academic scholarship; the art market and commodity culture also played significant roles in constituting De Stijl as we have come to know it today. 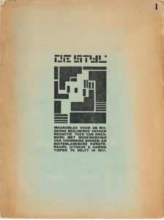 Disputing the notion that a coherent Stijl group had ever existed, Vantongerloo noted that many of the artists associated with the journal had not actually met one another. As far as he was concerned, the significant figures—Piet Mondrian and Bart van der Leck, for example, in addition to himself—were already well known; their histories did not need to be recounted. Indeed, the organization of retrospective exhibitions or the writing of De Stijl’s history would, he believed, lead only to distortion and misrepresentation. How then did De Stijl coalesce as an historical phenomenon? What might account for the consensus view that eventually emerged of a movement organized around a journal and comprising painters, architects, and other artists dedicated to a common vision of aesthetic purity and social improvement—the view that there was a group, and not just a loose association of individual personalities who shared certain formal commitments but who otherwise argued bitterly? Is this simply the result of the artists’ and architects’ common embrace of a rigorous formal language of geometric abstraction and a limited palette of primary colors, visible in so many works now in the Stedelijk collection: not only the paintings by Mondrian, Van Doesburg, Bart van der Leck, and Cesar Domela, but also the abstracted, so-called counter-compositional architectural designs by Van Doesburg and Cornelis van Eesteren of 1923; as well as the graphic work of Huszár and Piet Zwart; and, equally notable, the museum’s extensive collection of Gerrit Rietveld’s furniture, beginning with his Red and BlueChair (1918–1923/ca. 1923, Fig. 2)?5 Or does that consensus view of a unified and relatively stable movement, projected by the works exhibited in the museum, mask a more complex reality that the objects alone cannot reveal? Consider the following: In 1927 Van Doesburg’s retrospective assessment of De Stijl’s accomplishments, offered from a polemically engaged position that he forged for himself at the centre of its activities, openly questioned the coherence of the movement; however, his unexpected death four years later inevitably changed the terms of the debate that he himself had fostered. The final issue of the journal, posthumously published by his widow, Nelly, in 1932, was dedicated to Van Doesburg, whose work and ideas were eulogized by an impressive range of artists and architects, including many of those with whom he had collaborated (and argued) and whose writings had appeared in De Stijl. In this way, a group identity was, ironically, formed around the absent figure of Van Doesburg, whose activism and willingness to embrace controversy throughout his life had made him responsible for much of the rancor experienced by those affiliated with De Stijl. This groundbreaking presentation of De Stijl activity in a broad range of media— including not only architecture and painting but also furniture, stained glass, and graphic design—marks the point at which its historical significance was secured. 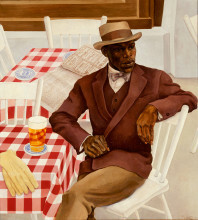 Even a cursory review of the manner in which this exhibition took shape and the competing forces behind its organization reveals that, just as De Stijl was being accorded a central role in the evolution of the modern movement by Barr and others, its defining features were still being contested by some of the artists and architects included in the show, who clearly understood that their careers would be judged to a significant degree by the historical assessment of their achievements within the context of De Stijl. The Stedelijk Museum is therefore central to our appreciation of De Stijl not only because it holds many important works in its diverse collections, but also because it shaped the first comprehensive historical presentation of De Stijl in its exhibition of 1951. 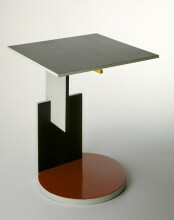 Although Oud and Van Eesteren initially questioned the need for an exhibition devoted to the Stijl group and its influence on contemporary architecture, Rietveld immediately embraced the possibility, offering to organize and design the exhibition and to make reconstructions of architectural models as well as new examples of his own earlier furniture designs (the latter to be acquired by the Stedelijk Museum, where today they form a significant part of the collection (Fig. 5-7). As Rietveld’s plans came into focus, Van Eesteren objected that the exhibition would be oriented too much toward individuals rather than to a collective ideal shared by all the artists of De Stijl. Since his role in De Stijl was arguably determined less by the independent contribution he might have made while a very young architect in the early and mid-1920s than it was by his important collaborations with Van Doesburg in those years, it is hardly surprising to find him taking this position. Oud on the other hand questioned any potential emphasis on collaboration (understandably, since his own collaborations with Van Doesburg had culminated in a major disagreement that resulted in Oud’s departure from De Stijl in 1922); he wished to stress instead the distinctive contributions of individual artists and architects affiliated with the movement. 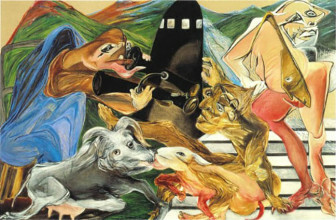 More specifically, many of the participants (not only Vantongerloo) sought to influence the ways in which they would be represented in the exhibition. For example, Van ‘t Hoff, who left De Stijl shortly after the journal was inaugurated, wanted to expand the chronological range of his designs in the show to encompass works built both before and after his participation in De Stijl. 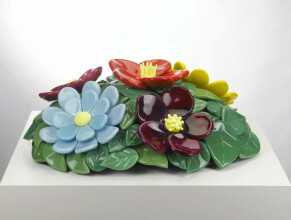 The same was true of Oud, who regarded the exhibition as an opportunity to bolster his international reputation as a master of modernism, which had suffered ever since his flirtation with ornament in the design of the Shell Oil headquarters in The Hague in the late 1930s and 40s, well over a decade after he had ceased publishing in De Stijl. 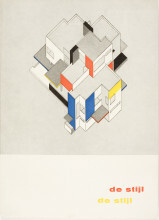 Van Eesteren also made demands on how his work would be presented in the exhibition, stipulating that he must be credited alongside Van Doesburg for his own, oftenoverlooked contribution to each of the three model-house projects that had been shown in 1923 in the only De Stijl exhibition organized during the heyday of the movement. He protested the frequent attribution of these hugely influential works to Van Doesburg alone, noting that the focus on Van Doesburg’s role had increased in recent years (a veiled suggestion, perhaps, that Nelly’s advocacy of her husband’s significance as an artist and leader of De Stijl was responsible for his own relative devaluation). Moreover, Van Eesteren argued that because the three models “received a personal character through the manner of their evolution and of their paint treatment, they are comparable to a painting and thus ‘unique.’”19 They should therefore not be reconstructed for the retrospective exhibition. While Van Eesteren blocked the display of these architectural models (perhaps because they were more closely associated with Van Doesburg than himself) on the grounds of their originality and uniqueness, Oud expressed no objection to the reconstruction of models of his early De Stijl building designs for a beach boulevard (1917) and a factory at Purmerend (1919). Indeed, as Broekhuizen has pointed out, Oud was especially concerned to promote these works as indications of the important role he had played in the introduction of Cubist architecture, “a historical mystification that he tirelessly defended from the beginning of the 1950s” while writing his book, Mein Weg in De Stijl (published in Germany only with difficulty and not until 1960), one of several means through which Oud was trying to validate his current practice by relating it to his much more widely acclaimed, De Stijl–related work of the late teens and 1920s.20 It is noteworthy that reconstructions formed a significant part of the exhibition through which the Stedelijk Museum helped to establish the historical profile of De Stijl in 1951. 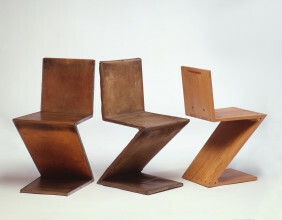 Not only did Rietveld remake numerous architectural models for the show, he also authorized new examples of furniture to be constructed by his associate, G.A. van de Groenekan, according to designs that had originated decades earlier. These included his so-called Red and Blue Chair (1918–1923), and his Elling Buffet (1919), both of which were illustrated in De Stijl and have since become inextricably associated with the movement’s formal expression in furniture as designs that have always been closely identified with sculpture—which is how Van Doesburg presented them in the journal. That these examples were reconstructed for exhibition and purchase by the Stedelijk, and that they were shown there and at MoMA along with such vintage pieces made by Rietveld himself as the Berlin Chair and the end table, both of 1923, points to a collapse of distinction between originality and reproduction at the very moment when De Stijl was being sanctioned by the museum as a movement worthy of both aesthetic appreciation and historical scrutiny.21 At MoMA, too, alongside the paintings and many other unique and original objects in the De Stijl exhibition, a significant number of reproductions were also featured. Given the fact that MoMA under Barr’s direction had pioneered the notion of the museum as an institution with a significant commitment to public education that could encompass both fine art originals and industrially designed multiples—a model much admired at the Stedelijk—it is perhaps not surprising that under the combined aegis of these museums, De Stijl would enter art history in this hybrid form. 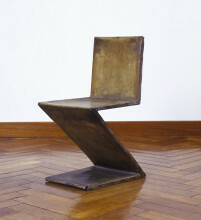 Overy points out that it was no doubt the “‘fine art’ qualities of a number of examples of furniture by Rietveld from the De Stijl period which have caused these to be better known than his more functional pieces,”23 but at the same time he insists on the popularization of Rietveld’s work through reproduction. 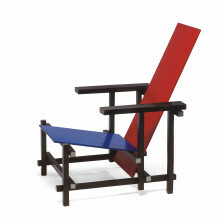 This practice was not limited to the high end of the market dominated by Cassina, nor to those who built their own examples of favorite designs; it also included those who purchased mass-produced kits for constructing scale models of the Red and Blue Chair and the Schröder House, both of which were authorized by Rietveld’s heirs in 1983. The following year, Van Eesteren granted permission for a similar, commercially available kit to reproduce one of the three model houses on which he and Van Doesburg had collaborated in 1923. Described in a booklet included in the kit as Van Eesteren’s 'brainchild', this particular model had not been remade for the Stedelijk exhibition in 1951 due to Van Eesteren’s objections; here, however, the kit’s producers acknowledged “the readiness with which he granted us permission to publish the cut-out.” They also thanked the Haags Gemeentemuseum for allowing access to its reconstruction of the same model, which had been commissioned by the museum and was in its collection.24 The kits for these architectural models, and one for reconstructing Huszár’s Mechanical Dancing Figure of 1923, all included printed texts by recognized scholars (Marijke Küper, Sjarel Ex, and Els Hoek) that describe the historical background against which the original objects had been developed in the 1920s. Thus, informed scholarship on De Stijl generated in the 1980s and sanctioned by a museum was not divorced from the simultaneous workings of commodification but was instead on occasion marshaled to support that very process. In fact, De Stijl has always circulated both high and low; as a historical phenomenon, it has been widely appreciated at the level of fine art as well as that of commodity culture. That academic or museum scholarship often forges the link between these categories was manifested once again in 1994, when Mondrian’s Paris studio was reconstructed for exhibition in the main hall of H. P. Berlage’s Exchange Building in Amsterdam. This project, carried out with extraordinary attention to detail by a team of scholars under the direction of Frans Postma, was based on extensive historical research presented in a profusely illustrated book published on the occasion of the exhibition, when the studio interior was also made available for purchase in the miniature form of a scale model intended to be cut out and assembled by enthusiasts of Mondrian’s work.25 Numerous other interiors created by De Stijl artists have been reconstructed at reduced and full scale over the years, attesting to a desire to preserve (or re-create) not simply individual design elements but, more importantly, the experience of their integration within an encompassing spatial environment. 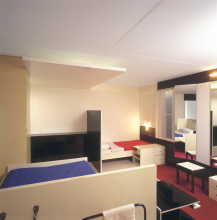 When for example in 1971 the Stedelijk Museum acquired intact a chromatically and formally harmonious bedroom designed in 1926 by Rietveld together with Truus Schröder-Schräder, a total of 76 building elements (including rebuilt walls, a lowered ceiling, and the original floor covering) as well as 15 items of furniture (both built-in and free-standing pieces) were installed at the museum (Fig. 9). The effect thus created, however faithful to the reality of the original interior—the room was, after all, authentic in every detail—was at the same time unavoidably stripped of the vital functionality that presumably animated the space when it had actually been in use (Fig.10). The bedroom has been maintained ever since as an aesthetically pleasing and historically accurate period room not unlike many others of diverse origins whose contents document vanished lifestyles for museum visitors throughout Europe and North America. As such, the Stedelijk’s reconstructed interior (like the other De Stijl works in the museum’s collection) attests to the fact that De Stijl has indeed entered into history, where ongoing reinterpretation of the movement will continue to foster the discovery of new meanings in the distinctive forms it produced. 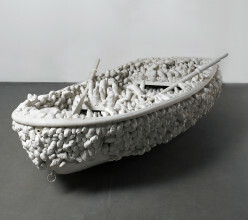 It is, I would argue, the inevitably changing nature of the interpretive paradigm that continues to animate the objects in the Stedelijk collection, enabling us to see them anew and to experience their historically embedded forms as meaningful to our contemporary situation—despite the contradictions this entails. Fig. 10 Photograph of bedroom in the Harrenstein house at Weteringschans 141, Amsterdaam, n.d.
1. Paul Overy, De Stijl (London, 1991), p. 17. 2. 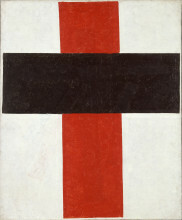 Theo van Doesburg, “Ik kan over deze factoren, die het wordingsproces der zoogenaamde 'Stijlidee’ en der Stijlbeweging bespoedigden en bepaalden, niet schrijven, zonder een betrekkelijk auto-biografisch accent aan dezen terugblik te geven. Volkomen objectief blijven is hier slechts ten Fig. 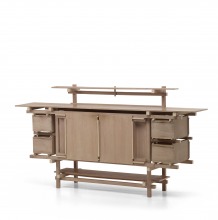 9 Gerrit Rietveld, Partly designed in collaboration with Truus SchröderSchräder, Harrenstein Bedroom, 1926, various materials, 303 x 508 x 591 cm, commissioned by Dr. R.J. Harrenstein and his wife, An Harrenstein-Schräder Fig. 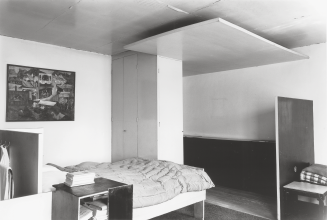 10 Photograph of bedroom in the Harrenstein house at Weteringschans 141, Amsterdaam, n.d. 13 /14 deele mogelijk.” “10 jaren Stijl: Algemeene inleiding,” De Stijl 7 (1927) 79 –84, p. 2. Although dated 1927, this issue of the journal did not appear until the following year. 3. Georges Vantongerloo, “Je ne puis pas vous suivre dans votre désir de me prendre comme témoin qui, par le fait d’exposer sous le titre De Stijl, accepte et approuve toutes calomnies et grossièretés que V. Doesburg a publié dans ‘10 Jaren stijl 1917 – 1927’.” Letter to Willem Sandberg, 16 June 1951, Archives of the Stedelijk Museum, Amsterdam, Folder 3427. 5. At the time this article was written, the Red and Blue Chair was the oldest piece of Rietveld furniture in the collection. 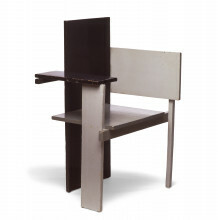 In 2008, however, the Stedelijk and the Centraal Museum in Utrecht jointly acquired Rietveld’s Witteveen High Chair (1918/1921 – 1922), which predates the Red and Blue Chair by a couple of months. 6. Alfred H. Barr Jr., Cubism and Abstract Art, exh. cat. (New York: Museum of Modern Art, 1936), p. 141. 7. Michael White, De Stijl and Dutch Modernism (Manchester and New York, 2003), p. xiii. 8. The exhibition was also shown at the Venice Biennale of 1952. 9. H. van Werden -Griek, letter [in English] to D. F. Lunsingh Scheurleer, 5 February 1947, Nederlands Architectuur Instituut, Rotterdam, EEST x -760. 10. The exhibition, Modern Architecture: International Exhibition was held at the Museum of Modern Art in New York between February 10 and March 23, 1932. While preparing the show and accompanying book (Henry -Russell Hitchcock Jr. and Philip Johnson, The International Style: Architecture Since 1922, exh. cat. [New York: The Museum of Modern Art, 1932]), Johnson also wanted to acquire a painting by Mondrian; too busy in Germany to visit the artist in Paris, he asked Oud to make the selection on his behalf: “If you can get me a good one that is reasonable enough, I shall be delighted to take it unseen.” Johnson, letter to Oud, n.d., Nederlands Architectuur Instituut, Rotterdam, Oud Archive, B64, 64:30:130. In 1941, Johnson donated this painting to MoMA, and the work was subsequently included in the memorial Mondrian exhibition that MoMA organized in 1945, the year after the artist’s death. Oud’s work is represented in the Stedelijk by his graphic design of several publications of the early 1920s related to his architecture. 11. Sandberg was involved in the organization of the Dutch contribution to the 1939 World’s Fair in New York and came into contact with Barr in that context; the two met for the first time in Paris in 1938. That Sandberg regarded MoMA as a model for how the Stedelijk Museum should present modern art is discussed in Caroline Roodenburg -Schadd, Expressie en ordening: Het verzamelbeleid van Willem Sandberg voor het Stedelijk Museum 1942 –1962 (Amsterdam and Rotterdam, 2004), p. 79. 12. Dolf Broekhuizen, De Stijl toen/J. J. P. Oud nu. De bijdrage van architect J. J. P. Oud aan herdenken, herstellen en bouwen in Nederland (1938 –1963) (Rotterdam, 2000), pp. 285 –291. Broekhuizen provides a detailed account of the polemical positions assumed by many of those involved in organizing this exhibition and suggests how their ideas were borne out in the exhibition itself. 15. The following, necessarily summary account of some of the issues raised during the organization of the exhibition is based primarily on archival materials in the Stedelijk Museum, Amsterdam (folders 3425, 3426, 3427), and the Nederlands Architectuur Instituut, Rotterdam (the papers of J. J. P. Oud, Gerrit Rietveld, and Cornelis van Eesteren). 16. Wies van Moorsel suggests that the 1951 De Stijl exhibition actually originated in discussions between Nelly van Doesburg and the Museum of Modern Art during Nelly’s stay in New York in 1947. See Moorsel, ‘De doorsnee is mij niet genoeg’: Nelly van Doesburg 1899–1975 (Nijmegen, 2000), pp. 196–197, 239. 17. Hans L. C. Jaffé was able to build on the expertise he developed through his involvement in the Stedelijk exhibition and catalogue to produce a doctoral dissertation, the first scholarly monograph on De Stijl, in 1956: Jaffé, De Stijl 1917–1931: The Dutch Contribution to Modern Art (Amsterdam, 1956). 18. The issue was raised by Oud (who described Van Doesburg as De Stijl’s “organizational and connective focal point”) in a letter to J. H. van den Broek, dated 9 June 1951 (“Daarom moeten we ‘De Stijl’ vooral blijven zien als de organisatie, waarvan Van Doesburg het organiserend en bindend middelpunt was.”); a typed copy, together with a typed copy of Van den Broek’s response, is in Nederlands Architectuur Instituut, Rotterdam, EEST x-760. See also the copy of Van den Broek’s letter to Jaffé, dated 11 June 1951, in the same archive. 19. Cornelis van Eesteren, “Doordat zij een persoonlijk karakter hebben gekregen, door de wijze van ontstaan en de beschildering zijn zij te verglijken [sic] met een schilderij en zijn dus ‘einmalig’.” Letter to Willem Sandberg, 2 July 1951, Nederlands Architectuur Instituut, Rotterdam, EEST x-760. 20. Broekhuizen, De Stijl toen/J. J. P. Oud nu, pp. 290 ff. 21. When the exhibition was sent to MoMA, Rietveld also included a reconstruction of his Child’s Wheelbarrow so that Oud would not have to part with the version shown at the Stedelijk, which Rietveld had originally designed and made for Oud’s son in 1923. 22. Overy, 'From Icon to Prototype' in Peter Vöge, The Complete Rietveld Furniture (Rotterdam, 1993), p. 12. 24. 'Note from the Designers of the Cut-Out', in Maison d’Artiste (Copyright Victor Veldhuyzen van Zanten, Gouda, and Copyright Tjaarda Mees, Amsterdam, 1984). 25. The exhibition Mondrian’s Studio, Earthly Paradise (Amsterdam: Beurs van Berlage, 1994–1995) was organized as part of the Mondrian Year proclaimed by the Dutch government to commemorate the 50th anniversary of Mondrian’s death. See also Frans Postma, 26, Rue du Départ: Mondriaans atelier in Parijs, 1921–1936, ed. Cees Boekraad (Berlin, 1995). 25. The exhibition Mondrian’s Studio, Earthly Paradise (Amsterdam: Beurs van Berlage, 1994–1995) was organized as part of the Mondrian Year proclaimed by the Dutch government to commemorate the 50th anniversary of Mondrian’s death. See also Frans Postma, 26, Rue du Départ: Mondriaans atelier in Parijs, 1921–1936, ed. Cees Boekraad (Berlin, 1995).